(See voluntary charity info for Wounded Warrior Project below). This is an off road driving, navigation and communication challenge. Participants are assigned to one of four off road driving teams. Both the day course and the night course are unknown in advance. 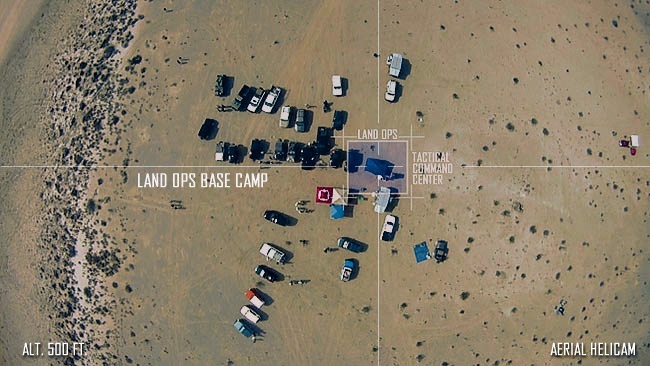 Teams will navigate to way points where they will find previously hidden geotactical caches that contain instructions telling them how to proceed and what tasks to perform. Teams will give and receive instructions to one another and synchronize their progress to achieve a common objective. All Land Ops events are free of registration fees, however, this event has a "voluntary $35 registration fee" (NOT REQUIRED TO ATTEND). We will be simultaneously raising money for the Wounded Warrior Project. This is an honor and privilege to be able to contribute something to help the men and women who served our country and paid a very high price in doing so. 100% of the voluntary registration fees raised will be forwarded to the Wounded Warrior Project. I know I know I know. We're coming North guys...We're looking to plan a recon in the northern Sierra's and 3-6 months after the course planning trip we'll schedule a Northern Sierra op. We hear you and we're coming! Really need to get an annual nav comm event here in the north. Looks like a great time. Maybe something near gold lake or even Peavine area in Reno to dog valley area. Just thinking outl loud here. This actually looks really cool! Yea it would be cool to have one here in Northern Nevada. A money pit aka as decently built 2007 Jeep JK Unlimited with a lot of goodies. Yeah I would be excited to see this come closer to home. I really enjoy these events. Even splitting the difference, distance wise, would make this an easier trip for me. I would be there. Going so far though I'd need to take an extra day for just travel. So why wait for this event there's one much sooner than that! Its just a road with a few rocks, keep driving! Sorry I will be in Oregon for that week so we will see when the next one is. I hear you guys...we're coming. We will definitely be further north with an event or two next year. There's one on Sept 14, a little closer to you. We're looking further north next year. I wish I could make this trip. I'm a simple man. I like pretty dark-haired women and breakfast food. I saw that one and it looks great. I just didn't see it in time to move my work schedule around.